The journal has appeared since 2008 and it is a continuation of the unsystematically published periodical magazine at the University of Nicolaus Copernicus. The origins of the journal date back to the year of 1971. It was then that the first copy appeared from the series of "Scientific Booklets of the University of Nicolaus Copernicus in Toruń. Humanistic and Social Sciences. Pedagogy". From 1973 to 2004 a number of volumes of the journal were published under the name "Acta Universitatis Nicolai Copernici. Humanistic and Social Sciences. Pedagogy". 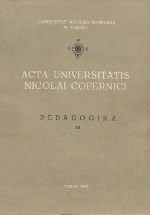 After the Faculty of Education at the University of Nicolaus Copernicus was established in 2007, it appeared to be a pressing task to promote the journal for the sake of the Faculty. At the same time, this reflected a tradition concerning the popularization of the educational field at the University of Nicolaus Copernicus. Following the numbering of the volumes we would like to emphasize the evolution of the Faculty of Education in Toruń. Thus, the "Scientific Booklets of the University of Nicolaus Copernicus in Torun. Humanistic and Social Sciences. 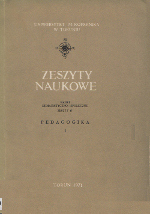 Pedagogy" published in 1971 were initiated by the Institute of Education whereas, "Acta Universitatis Nicolai Copernici Humanistic and Social Sciences. Pedagogy" appearing from 2008, is a result of the project run by the Faculty of Education at the University of Nicolaus Copernicus. The journal is designed to suit for every academic researcher of various educational sub-disciplines. Among the authors of articles there should be not only be experienced specialists, but also young scientific researchers, whose achievements are worth circulation. We wish our journal to act as giving information, being critical, supporting appraisal and announcing new sources. That is why, next to the articles we are going to publish announcements, research reports and materials. Moreover, we are planning to provide information about the publishing activity and about the organizational and scientific works to do with education sciences both in Poland and abroad. In order to present various issues connected with education and diverse writing forms the journal was divided into sections: articles, materials, announcements, research reports, reviews and scientific chronicle. In order to fulfill all these assignments the editor is counting upon the cooperation with all the academic centres in Poland and wishes our future authors optimum creativity.